Music to Her Ears: Ryoko Garcia paints a song with legendary music artists Ray Charles, Elvis Presley, and Sammy Davis, Jr., for our April 2014 cover. 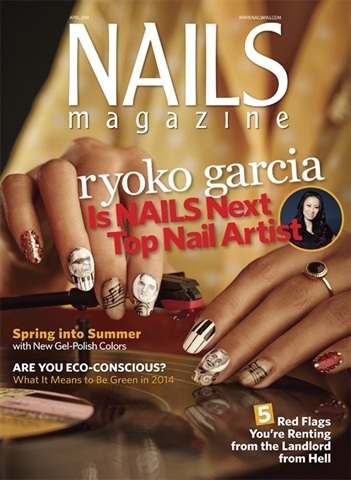 As huge fans of Next Top Nail Artist winner Ryoko Garcia’s intricate handpainted faces, we asked her to do a musical-themed cover with some of the great old school musicians painted on the nails. Her portraits are quite time-consuming, so for this month’s cover she painted the faces of music legends Stevie Wonder, Elvis Presley, and Sammy Davis, Jr. on small acrylic disks before the shoot. 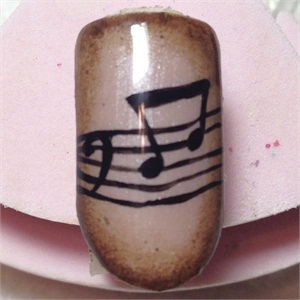 Once she arrived at the shoot, she got to work creating her vintage musical nails. In addition to portraits of Ray Charles, Elvis Presley, and Sammy Davis Jr., she added piano keys, aged musical sheets, vintage swirls, and a little touch of glitter and bling to the set of nails. 1. 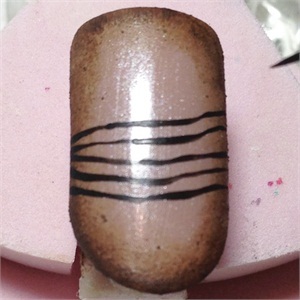 Shape the nail tip and buff the surface. Wipe it off with alcohol. Apply Gelish Foundation and cure. 2. Apply two coats of Gelish in Skinny Vanilla Latte, curing after each coat. 3. 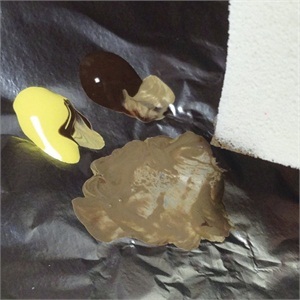 Mix dark brown and yellow acrylic paints. 4. Using a sponge, gently tap the paint mixture around the edge of the nail. 5. Follow this by gently tapping dark brown paint on the edge of the nail to create an antique feel. 6. Using black acrylic paint, draw five lines to create your musical staff. They don’t have to be even. The slightly wavy effect helps to create the aged feel of the nail. 7. With the same black acrylic paint, draw a backwards “C” for the bass clef and apply two dots, two lines, and a connecting line to create the music notes. 8. Apply Gelish Top It Off and cure.